OctaFX is a thriving micro forex broker, accompanying great customer service with tight spreads. This broker is great for beginners who are looking to learn a few things while making a couple dollars to build their portfolio. The interface is easy to use and their platform is supported by iOS, Android, Windows Mobile as well as desktop platforms. When you have questions, their customer service is quick and happy to assist in any way they can. OctaFX is a thriving micro forex broker, accompanying great customer service with tight spreads. This broker is great for beginners who are looking to learn a few things while making a couple dollars to build their portfolio. The interface is easy to use and their platform is supported by iOS, Android, Windows Mobile as well as desktop platforms. When you have questions, their customer service is quick and happy to assist in any way they can. Look forward to OctaFX's continual growth and if they consistently keep their customers happy as they have over the past year, they will quickly grow into one of the leading forex brokers online today. As mentioned before, they are specifically a micro broker now, but that could change as their clientele grows. 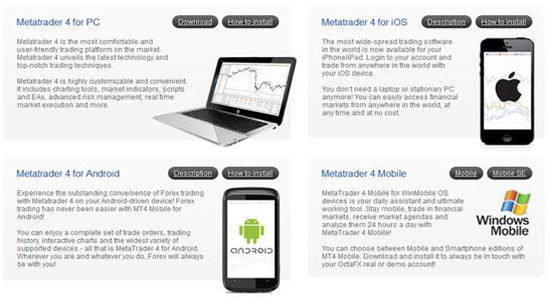 OctaFX is a new forex broker that has recently taken the market by storm and is quickly becoming one of the top online trading brokers, as far as micro accounts are concerned. They are based out of the Grenadines and Saint Vincent, but their customer service is available 24 hours a day, so no matter where you are located you will be able to reach a representative. They earned an award for the Fastest Growing Micro Forex Broker in 2012, awarded by the Global Banking and Finance Review. The main attraction is to beginners in the market. Micro accounts are traditionally 1,000 units, compared to the 10,000 units in a mini account and one hundred thousand units in a standard account. It is a great way to get your foot in the door and learn the ropes before jumping into a full account and losing a lot of money. There are many great features while investigating into OctaFX. One of the best is their easy to use website. Everything is laid out very smoothly and the interface is very user friendly. Beginners will have a smooth transition into the forex trading world, and many of the initial questions are laid out for you as you go through setting up your account. While some may see this as a downfall, there are secured withdraws, meaning you must confirm each withdraw through an email confirmation. This is an added bonus in today's society where identity thefts are prevalent and most money isn't stolen out of someone's wallet. It will only take you a few extra minutes to get hold of your hard earned money, but it is safe until you give the direct order to do so. Being a micro forex broker, it does not cost a lot of money to get your portfolio up and running. In fact, it can cost you as little as five dollars to begin trading on the market. Be aware that starting with five dollars with not make you rich overnight, and you will often have to sell and reinvest the same money in order to build your revenue. OctaFX does offer a few incentives that draw in many of their customers. 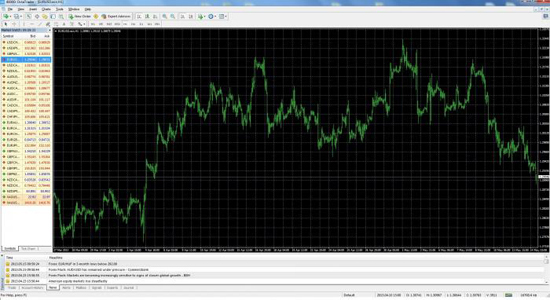 Many reviews from seasoned OctaFX users claim that they have very tight spreads, and their information confirms that the spreads are really tight. There are no re-quotes, ensuring that the prices you agreed upon will be the ones that you will see directly after you finalize your trades. There allow you to use expert advisors and as much insight as you can find to ensure you are making as much money as you can. There are two main types of trading accounts within OctaFX, the Micro and the ECN trading accounts, both offer different styles of trading, both backed with excellent reviews and customer service. OctaFX is well deserved of its newly found award. Their website claims to have support twenty four hours a day, five days a week, but there have been a lot of reports that a lot of the support can only be achieved during trading hours. Depending on where you live, it could be difficult to get hold of one of their representatives during those hours. There are other reports that mention that they have gotten hold of a representative and had their issues resolved outside of trading hours, so it is likely case specific. The only other downside to such a strong forex broker is how new the broker is. They have not been around long, and while their future is very promising, they are dealing with micro accounts and could quickly grow and encompass larger accounts, which pose both positive and negative results. As mentioned a few times prior, the Customer Support from OctaFX is one of the best in the industry. They have representatives available throughout the week, twenty four hours a day. They are very polite and courteous, if you speak their language. Unfortunately, since a majority of their clientele are from China and South East Asia, they do not offer many different languages for support. Luckily, they are a rapidly growing company and you can expect to see their support team grow rapidly to incorporate many more languages as they grow. You can email them with questions and you are typically given a very quick response. You can chat live over the internet for real market questions and advice. For those that live in China, Malaysia or within St. Vincent and the Grenadines, you can call them directly and one of the phone numbers listed on their website for quick access to a representative without the option for live chat. Look forward to OctaFX's continual growth and if they consistently keep their customers happy as they have over the past year, they will quickly grow into one of the leading forex brokers online today. As mentioned before, they are specifically a micro broker now, but that could change as their clientele grows.